I have lived in Washington DC for nearly four years. Why did it take me so long to eat at Rasika?! Perhaps because my husband (let’s refer to him henceforth as Mr. Green Bean) refuses to enter any Indian Restaurant due to an unfortunate aversion to those salacious aromas. But when the opportunity arose to ditch Mr. Green Bean and join a couple of girlfriends at DC’s king of modern Indian cuisine, I jumped! Now, let me preface this review and all to follow, by saying that while I consider myself a good judge of food quality, the dining experience as a whole greatly influences my overall opinion of a restaurant. Thus my reviews will not only discuss the cuisine, but also the quality of the experience based on a restaurant’s proficiency in serving a gluten-free diner. Having said this, Rasika is certainly a double threat: Amazing food, amazing experience. Once settled into a restaurant table, I often start a meal by announcing to the server my “allergy.” I analyze their reaction (bewildered, annoyed, deadpan) as the first indication of how defensive I should be. Once our waitress at Rasika told me the menu is roughly 90% gluten-free and began rattling off half a dozen of the best dishes that happen to be gluten-free, I relaxed quit a bit. When I quizzed her on a fish entree and she knew malt vinegar was one of maybe a hundred other ingredients, I knew I was really in good hands. My non-gluten-free friends and I sipped our cocktails in relief as we realized we could share plates without compromising anyone’s palate or health. We began with Rasika’s signature Palak Chaat, a sweet and savory crispy baby spinach snack, and Tawa Baingan, layers of eggplant and potato cooked to golden perfection on the griddle. 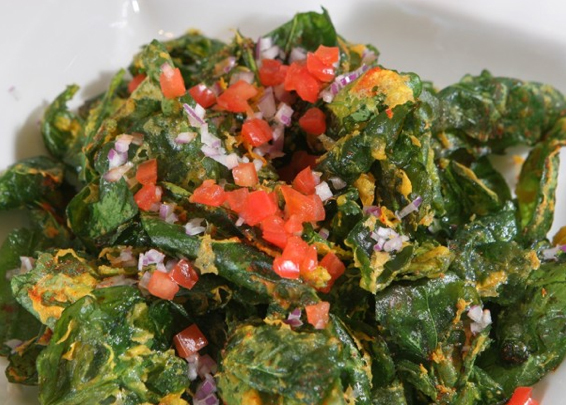 Palak Chaat, flash-fried spinach lightly glazed in sweet yogurt and date chutney. For entree’s the Kerala Shrimp Curry was layered with complex Indian spices, and the melt in your mouth Tandoori Lamb Chops were bursting with mild yet rich flavor. Gobhi Mattar (cauliflower) and Cucumber Raita balanced the meal just right. With a small side of Basmati Rice, I didn’t even miss the Garlic Naan. One spoonful of complimentary sweet cardamom ice cream rounded off the best gourmet Indian meal I have ever experienced. For one night, this Glutie Foodie almost forgot she had any dietary complications at all. Thank you, Rasika. I will be back. Categories: 5 Spoons, Cuisines, Indian, Spoon Ratings | Permalink. So excited to follow glutiefoodie as a fellow gluten-free gal myself! I am also a huge fan of Rasika. I really love the ghobi and black cod! Christine, so glad you can relate. Have a great time at Rasika. I can’t wait to go back. If only it were easier to make a reservation! There are companies such as WordPress that allow you to work within a template so that editing in HTML is not necessary. This is the method I use for my blog. It does limit you in terms of the stylistic changes you can make. However, it is extremely user friendly. And I can still fiddle with the HTML if I prefer. Hope this helps. Good luck. Thank you for the constructive criticism. I do have hopes of redesigning the blog and will definitely take your comments into account when that day comes. Enjoy! It’s a real treat. Feel free to follow glutiefoodie on instagram. I’ve just begun instagraming, so look for many more posts soon. Feel free to follow glutiefoodie on instagram! Useful information. Fortunate me I found your website unintentionally, and I am shocked why this coincidence didn’t happened in advance! That is so kind of you to say! I truly appreciate the compliment.